parchment or wax paper around the wrap. 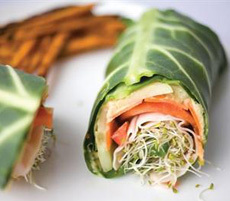 A few days ago, with the announcement of the new USDA Nutrition Guidelines, we mentioned collard wraps as a better-for-you sandwich option that fit right in. Simply cut off the stem (you can save it for salad or steaming) and trim down or remove the spine so the leaf will lie flat. If you remove the spine, you simply overlap both sides of the leaf, and fill and roll as if it were a whole leaf. We like to first blanch or lightly steam the leaves to make them more flexible and easier to both roll and bite. Whether or not you blanch, place the leaf underside-up, load the ingredients on one side of the underside, and roll like a burrito: Fold up the bottom, fold in the sides and roll. Here’s a video. Like any wrap or other sandwich, the creativity is up to you. You can simply roll up egg or tuna salad in the collard, or use a variety of different ingredients for layered flavors and textures. You can also accent your wrap with a dipping sauce. 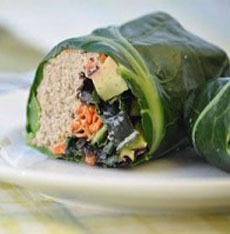 Collard wraps can be vegetarian or vegan, or rolled with eggs, fish/seafood, meat or poultry. Condiments: barbecue sauce, chili sauce, cranberry sauce, guacamole, horseradish sauce, hummus, ketchup, mayonnaise/aïoli, mustard, nut butter, pesto, pickle relish, salsa, tahini, tapenade, Thai peanut sauce, vinaigrette or other salad dressing, yogurt or any dip or spread. Spices: You can sprinkle the fillings with any spice, from curry to sesame seed. Herbs: You can add dry or fresh herbs (we like fresh basil, chives, cilantro, dill, ginger, horseradish, mint and parsley). Fruit: You can add sweet notes with fresh or dried fruit. Heat: If you prefer heat to sweet, add red chili flakes, diced jalapeño and/or a splash of hot sauce. Zest: If you have fresh lemons and limes, grate in some zest. 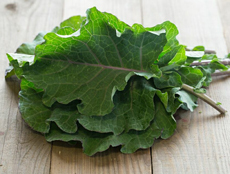 While they don’t get as much press as collard wraps, Swiss chard and Savoy cabbage make equally good wraps. 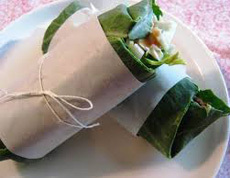 We adapted this wrap idea from Spring Vegan, which made it as a vegan wrap. We used actual corned beef and Swiss cheese, the fundamentals of a Reuben Sandwich. 1. REMOVE the stems from the collards, blanch them, let them cool. 2. ADD the ingredients to the collard leaf and roll up as you would would a burrito. 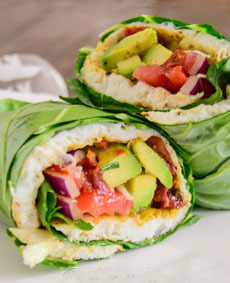 This recipe, for a classic raw vegetable wrap, is from Urban Remedy. However, we do prefer our sesame seeds toasted (how to toast seeds). 1. PLACE the nori sheet on a dry cutting board. Pat the collard leaf as dry as possible, and lay it atop the nori. 2. PLACE the carrots, cucumber, avocado and sesame seeds on one end of the collard leaf. If using hummus, spread it on the leaf before adding the vegetables. Sprinkle the vegetables with salt. 3. ROLL the leaf tightly, starting at the end with the vegetables. Eat it like a Japanese hand roll. If you haven’t used hummus, you can dip the roll in chili sauce, peanut sauce or soy sauce for moisture and flavor. Top: Make an egg wrap with fried, hard-boiled or scrambled eggs. Photo courtesy Pancake Warriors. Bottom: purple collard greens (the stems are purplish) from Good Eggs.